Star Wars Celebration exploded on its first day with the opening ceremony interviewing those who are responsible for the upcoming Star Wars: Force Awakens. JJ Abrams and Kathleen Kennedy started by discussing their love of Star Wars and how it got started to make Episode 7. Abrams and Kennedy both expressed how much they are fans like everyone else in the room. Some funny tidbits about getting started came with how the two were approached to get involved. Kennedy has been with Lucasfilm for quite some time, but it was a surprise she was selected by George Lucas. And it came in a casual business meal where Lucas also said he was retiring. Abrams was then approached after Disney bought Lucasfilm. Abrams didn’t want to do it at first citing wanting to do some things with his family. It was his love of the franchise that helped win him over. A lot was said about how much they are loving making the films. Real sets and real time effects were greatly used over digital ones. Abrams noted how great it is to have the actors see real sets and act around them instead of green screens. 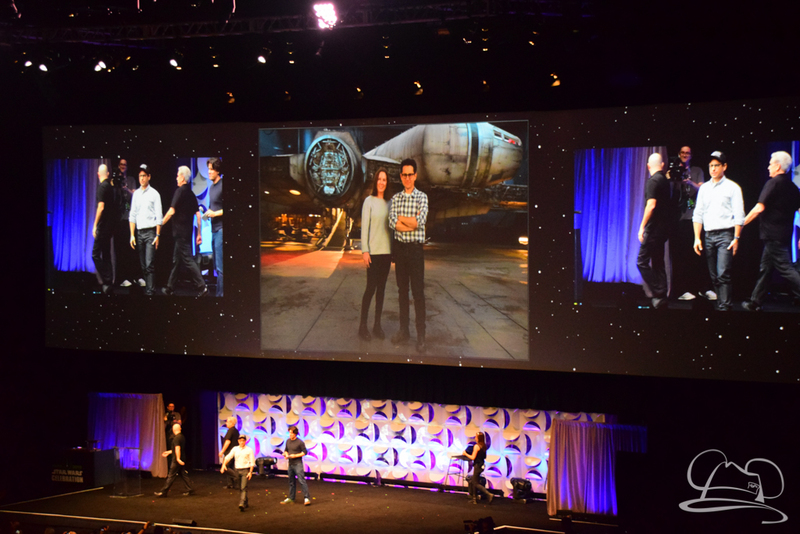 Fans got a treat as the newest members of the cast joined JJ Abrams and Kathleen Kennedy on stage. Oscar Isaac, John Boyega, and Daisy Ridley explained their involvement in the film, including their roles, and took questions from the audience. Boyega confirmed that he is a stormtrooper in the new film. Ridley will play a scavenger character. Isaac was ecstatic over getting the role of an X-Wing pilot, and so much so he wasn’t sure if he could really pull it off. After getting the call that he got the role he said that he blasted the opening credits music and grabbed something from his room to act out a lightsaber fight, remarking that he could pull it off. One bit of possible shock for fans is that the desert planet that has been seen in the trailers is not Tatooine. It’s a planet called Jakku. During the time that the new cast was introduced, the director and producer of Force Awakens talked about how they have met fans at Celebrations over the years. The result has been admiration of skills people have. That has led to hiring a couple of model makers and fans that were average Celebration attenders. They have helped create some of the new droids in the new film, including BB-8. They brought out real working models of R2 and BB-8 on stage! After a few tidbits were revealed with the new cast, including that the three characters are going to work together, a bit of a surprise came to the stage. Not only was there a legion of new stormtroopers paraded on, but some of the original cast that appears in the new film trodden out. Anthony Daniels, Mark Hamill, Peter Mayhew and Carrie Fisher brought on long applause. The quartet talked about how much they love the fans, and how great it has been to be part of the legacy of Star Wars. The film looks to be amazing, and though there weren’t very many details brought up, the panel served to tide over fans until the next big announcement, and eventually the film. Kicking off this Star Wars Celebration was an exciting and amazing presentation and shows there is much more to be had here!